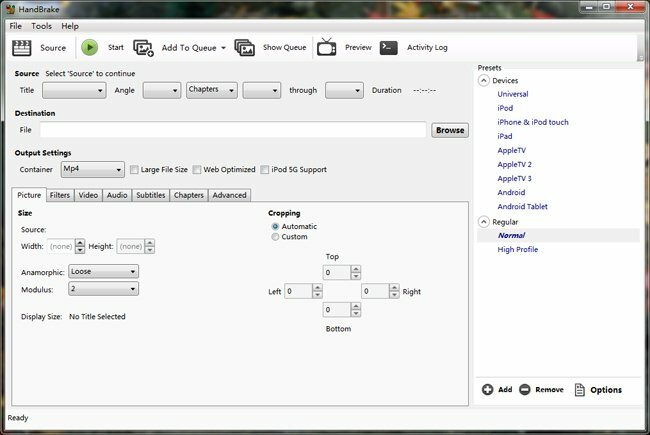 Editor Notes: Handbrake has no ability to decrypt commercial DVD disc, and the defaulty output setting is limited to MP4 and MKV. If you are seeking for an easy and quick way to Convert any encryped DVD ISO or protected DVD disc please turn to solution two. Here, Brorsoft DVD Ripper for Windows / Mac is highly recommended to help your convert any (protected) ISO file or DVD disc to MP4/AVI/MOV/WMV/FLV, etc videos in fast speed and excellent quality. Besides, the perfect DVD ripper also provides customized settings for almost all popular multimedia devices including iPhone, iPad, Android phone or tablet, Samsung TV, Xbox, PS3/P4 etc. Windows Version Brorsoft DVD Ripper taken as example, Mac Version share the same steps, just keep in mind you have download the right version, Windows platform .exe files cannot be installed on macOS – and vice versa. Install and run the DVD converter, click the "Load files" button to load your DVD ISO files to the program. Basically the "Common Video -> H.264 Video (*.mp4)" is just right. Tip: Click "Settings" button to do corresponding settings regarding to video, audio, subtitle for your videos. Finally, click "Convert" button to convert DVD ISO files to MP4/AVI/MOV/WMV/FLV, ect videos. When the conversion is over, click "open" to locate the convert ISO files. Then you can copy them to a USB Drive or home sever for playing on PMP devices, PC/Mac without hassle. And you can also use Video ultimate to convert videos, Blu-ray/DVD or ISO files to MP4/AVI/MOV/WMV/FLV for playback with ease.